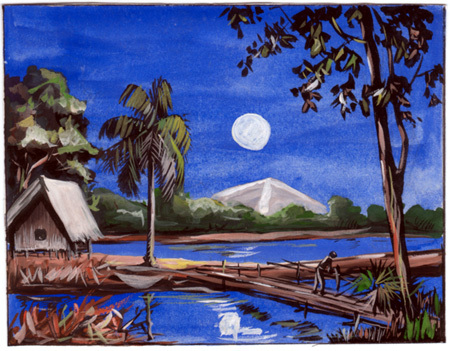 A small painting was sealed inside a letter sent from Cambodia for the better part of a decade waiting to be found. Delicate brushstrokes capture a lone figure on a bridge over a moonlit river. The figure is framed by still trees and a small quiet house sits nearby, capturing a tranquil evening, one guesses, near the painter's home in Cambodia. 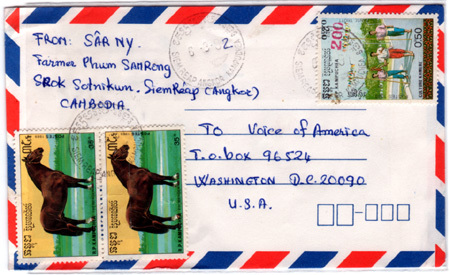 A couple of years ago I purchased a lot of Cambodian covers addressed to the Voice of America. In 1992 the VOA held an international contest that apparently generated a terrific response judging from the number of covers that have ended up in collector hands. In addition to providing interesting covers from Southeast Asia, the contest date happened to correspond with the time period that the newly independent Russian Republics were issuing a plethoria of local and fantasy stamps. The contest entries from both areas provide a good record of postally valid issues from this period. Most of contest entries were unopened by the VOA. One assumes that the volume of mail precluded anyone bothering to open each letter received for the contest and that only the winning entrants' mail were opened. It saddened me to think that sender, presumably the artist, had enclosed the painting in a contest entry and sent it to the United States where it could have easily ended up in a recycling bin without anyone ever seeing it. What had motivated this painter to enclose such a beautiful object in a mundane piece of mail? I decided to try and contact the sender to see if I could find out more. The return address on the contest entry was an individual by the name Hor Many - presumably the artist or someone who would surely know how to contact him or her. Were it not for the enclosed painting, the cover itself would be unremarkable. 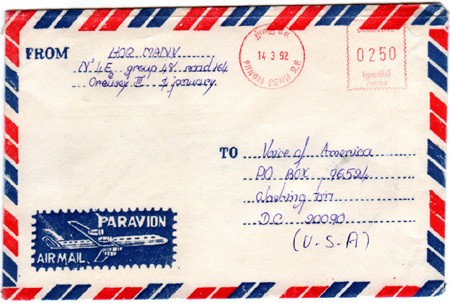 It was franked on March 14, 1992 with a 250 Riel meter stamp in Phnom Penh and sent via airmail to Washington DC. The nice thing about meter stamps is they enable collectors to pinpoint proper postage rates during a particular time period. 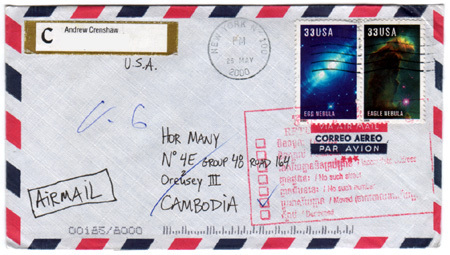 Shown nearby is another contest entry from Cambodia franked with 270R in stamps, which apparently overpays the airmail rate to the United States by 20R. According to the Universal Postal Union (UPU), the Cambodian Ministry of Posts and Telecommunication handles fewer than 40,000 pieces of mail each year. This is the lowest volume of any country. It is not difficult to image then that post offices probably do not keep large quantities of stamps on hand resulting in shortages of certain values as postage rates quickly change. When the post office runs out of a particular stamp, the next-available value is usually sold to meet the rate as nearly as possible. Of particular note on this cover is the 1989 0.50R stamp depicting Cambodian dancers surcharged 200R in red. Various stamps were surcharged in 1992 to produce high face value stamps to meet new rates due to spiraling inflation. This particular surcharged stamp is not yet listed in the stamp catalogs. On May 25, 2000 I sent off my letter to Hor Many to tell him that I'd found his painting and that I enjoyed it very much. I'd previously sent other letters to people in Cambodia and hadn't every received a response, so I wasn't optimistic. Still, I wanted to try. I affixed a couple of then-current space stamps, overpaying the overseas rate by 6-cents. I had run out of 60-cent and low-value stamps. Weeks, then months passed and I gave up on getting a response. Then, on July 5, 2001, my cover appeared in my mail slot. Apparently Hor Many had moved and the postal service was unable to locate him. A red boxed handstamp had been applied to the front of the cover, with the bi-lingual "Moved" box checked. The cover had also picked up a manuscript "V-6" marking somewhere along its journey and a sprayed-on routing code from the United States Postal Service. I flipped over the cover and found two backstamps from Phnom Penh, one dated 20-06-2000 - probably the original receiving mark, and one dated 27-10-00, perhaps the date the cover was determined to be undeliverable. What happened to the cover between October and July in anyone's guess. I find it fairly surprising that the cover made it back to me at all. Unfortunately I wasn't to locate Hor Many to thank him for his painting, but I got a nice returned cover from my attempt. His painting is hanging in my stamp den where I look at it often and wonder.